"Read this groundbreaking book and you’ll discover some simple truths about overcoming adversity. Part mediation, part how-to manual, Bright Triumphs illustrates through the prism of ten extraordinary individuals that confronting a hellhole is not the end of the world. According to Heenan, it could even be a required speed bump on the road to success–to, in the words, a Bright Triumph." 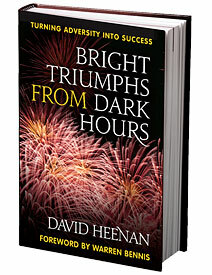 "Bright Triumphs from Dark Hours" examines the lives of ten extraordinary people who overcame great adversity in their personal or professional lives by applying winning strategies that guided them out of the darkness of near-defeat and into the light of success. From New York City school chancellor Joel Klein taking on the monumental task of overhauling the city's embattled public school system to renowned scientist Shirley Ann Jackson breaking down barriers to become the first African American woman to receive a doctorate from MIT and head a major research university to retired U.S. Navy Commander Scott Waddle reshaping his life after the Ehime Maru disaster - in these inspiring stories Heenan identifies key strategies that helped each person stay upbeat in the swirling vortex of tough times. The final chapter outlines these practices in greater detail and explains how they can be used to create personal roadmaps to negotiate life's darkest hours - from which come its greatest successes, its brightest triumphs.